Those savory pies of Alice’s are going right onto my fall menu rotation. They will be perfect to keep in my freezer to take for a lunch on the go. 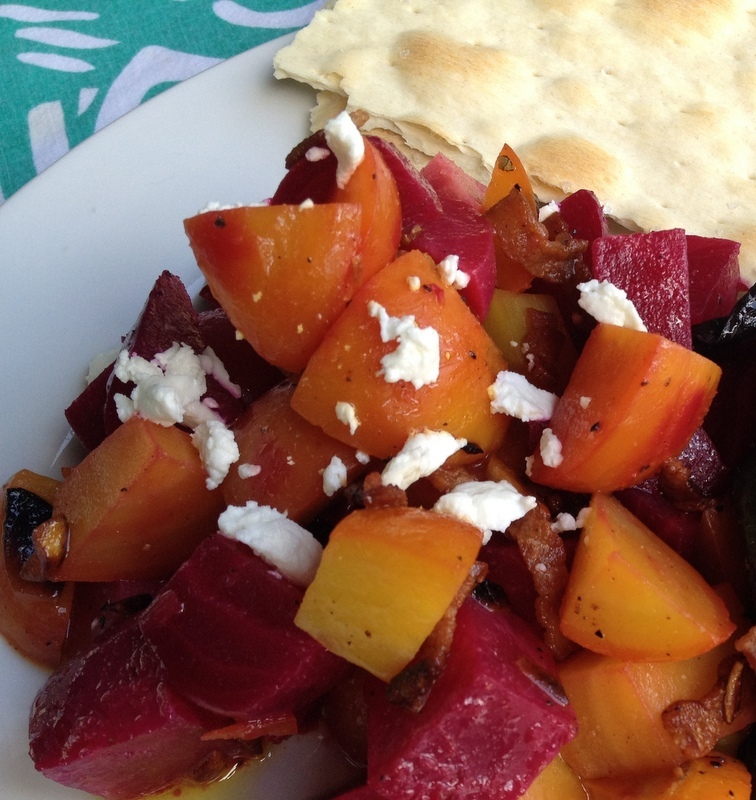 This beet salad would be a good accompaniment to the savory pies, as well as many other dishes. 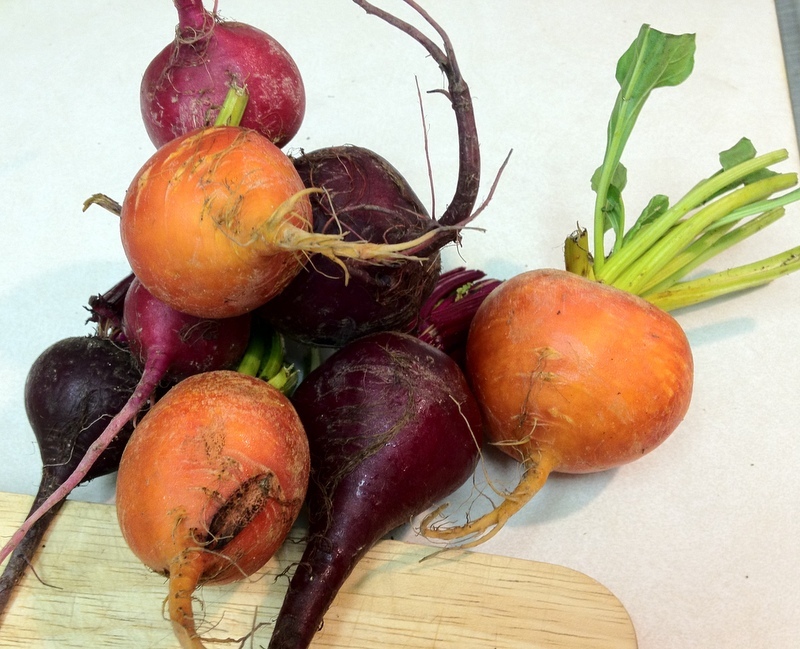 I got this recipe from my friend Diana after I picked up these gorgeous multicolored beets. It was certainly a winner, thanks Diana! I bought these from an organic farmer at the Mill City farmers market in Minneapolis. After scrubbing the skin, cutting off the stems and roots, I popped them into a large pot with a steamer basket and a couple inches of water to steam. 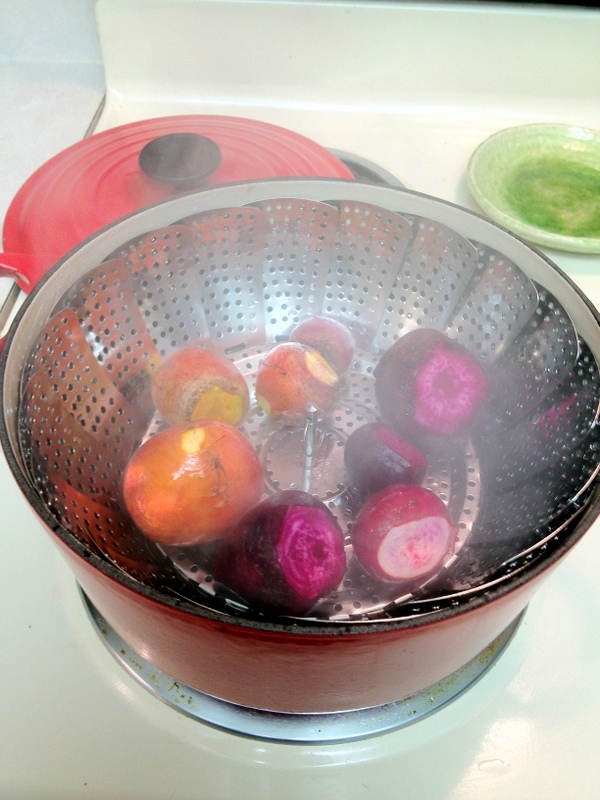 Keep pot covered and steam the beets until they are soft enough to be easily pierced by a fork. 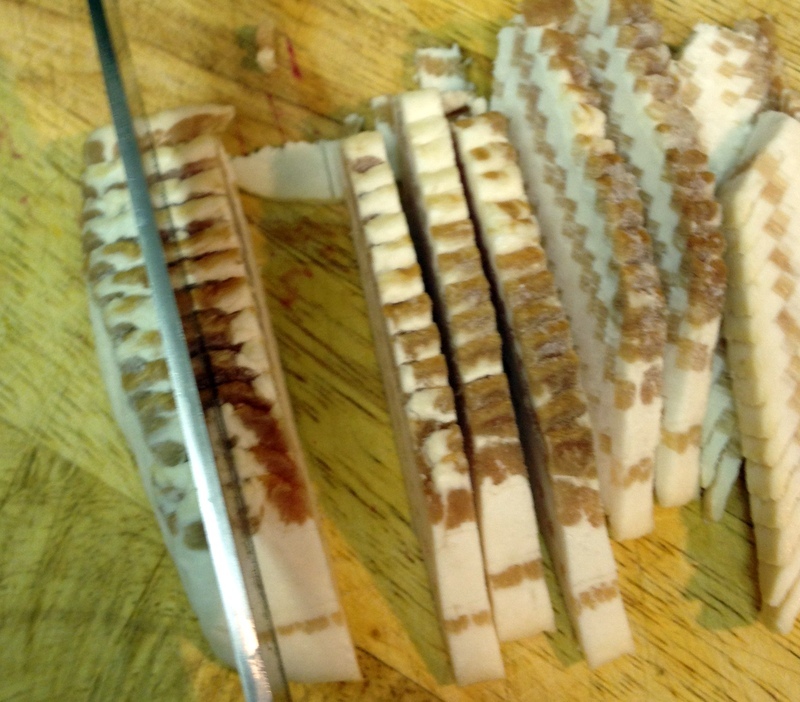 While they are steaming, chop up some bacon. Mmmmmm, BACON! Toss in some sliced garlic near the end to crisp that up as well. Drain and set aside. When the beets are fully steamed, pull them out and let them cool for a few minutes, then peel. You should be able to slide the peels right off with some paper towels. Chop them into bite sized pieces and let them cool. Whisk up a vinaigrette with olive oil, red wine vinegar, Dijon mustard and salt & pepper. 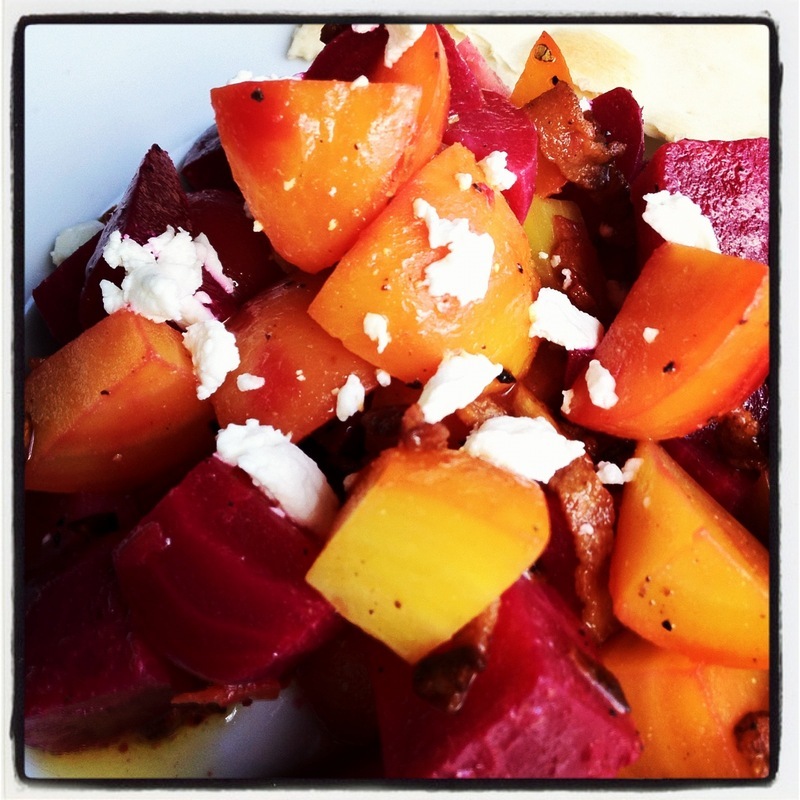 Toss the beets with the bacon bits, crisp garlic slices and the dressing, then crumble goat cheese over the top. Voila! Alice, I think we make a pretty good team with our dishes. What’s next? Remove stem and root of beets, scrub skin and place into steamer for 15-20 minutes or until they can easily be pierced by a fork. While beets are steaming, chop up bacon and place into skillet to crisp. 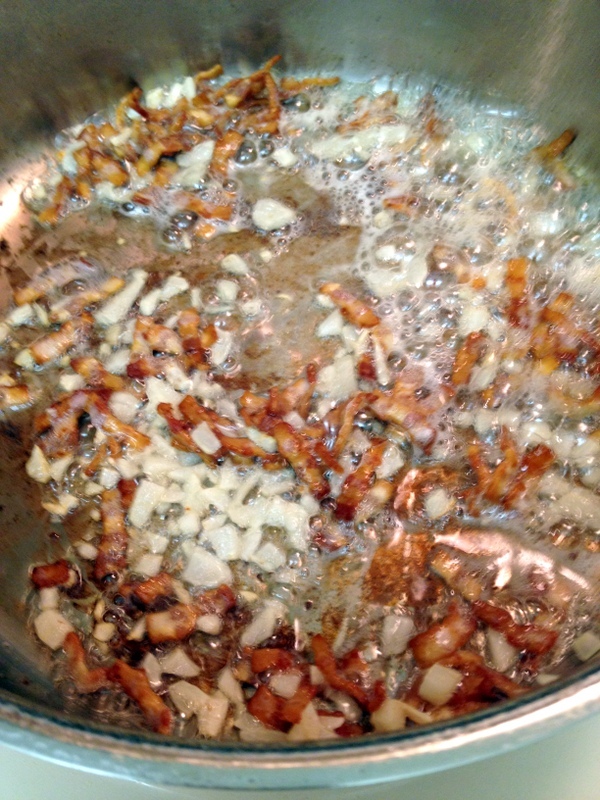 Add sliced garlic to skillet for the last few minutes to crisp as well. Do not burn the garlic, as it will get very bitter if it is burnt at all. Remove and let drain on a paper towel. 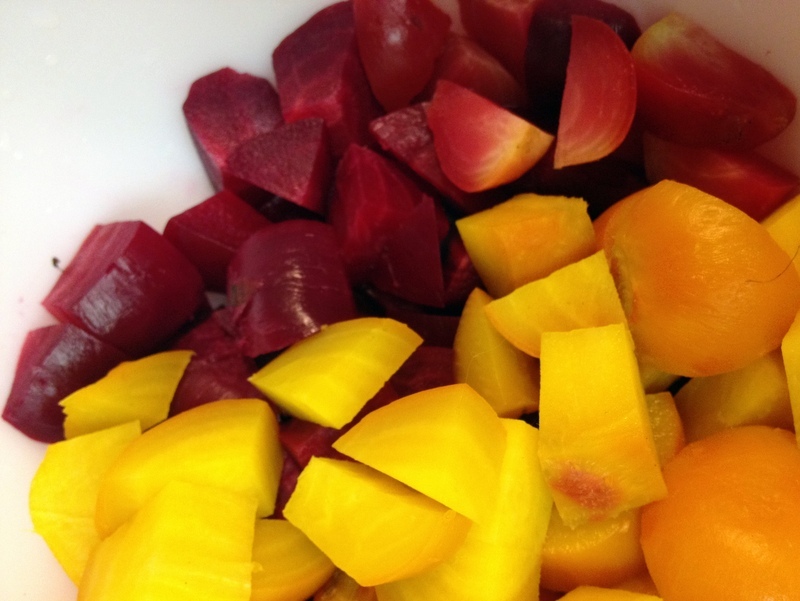 When beets are finished, remove from steamer and let cool for a few minutes. 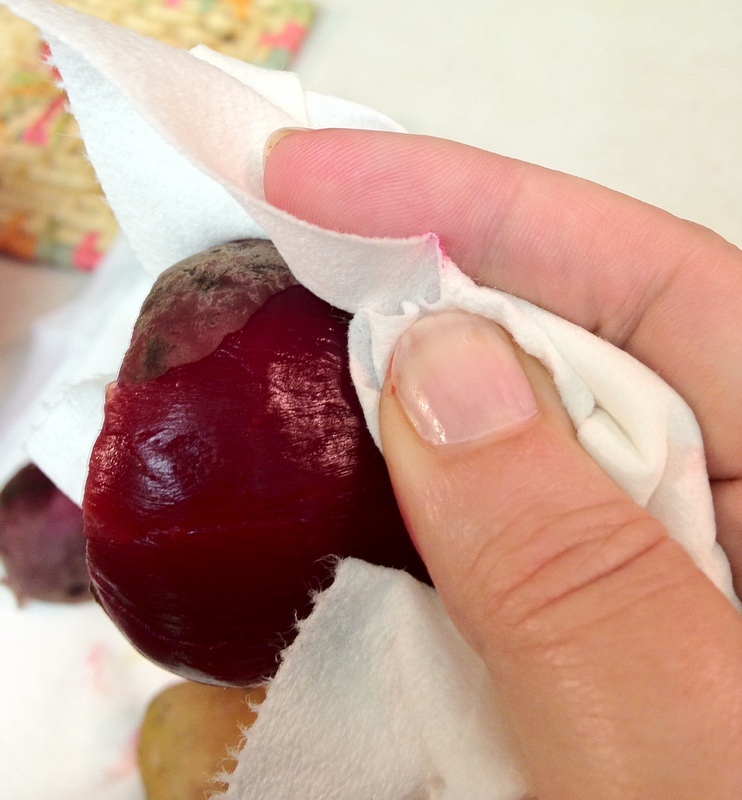 Then slide the skin off the beets with a paper towel, chop and let chill. 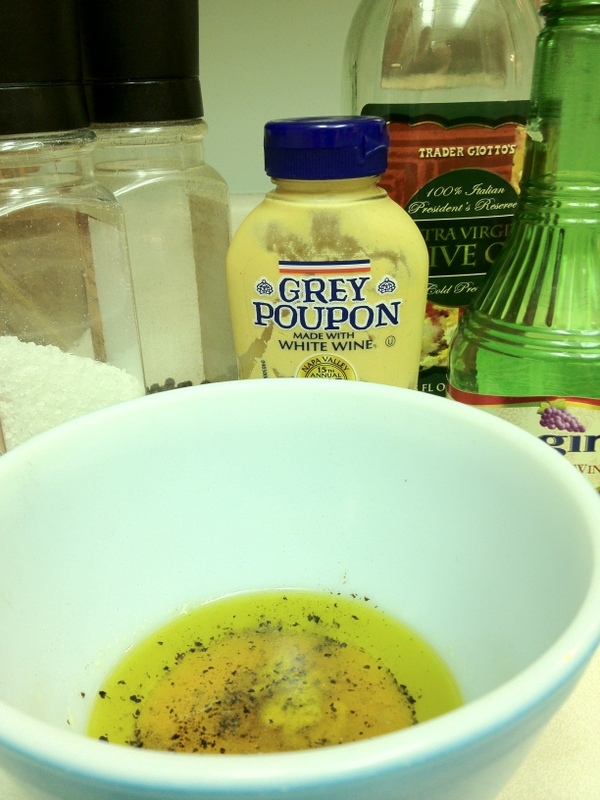 Whisk together the olive oil, red wine vinegar, Dijon mustard and salt & pepper. You may not need all of this dressing for the beet salad – in which case, you can store the unused portion in the fridge and use it on another salad. Toss all ingredients together and top with crumbled goat cheese. Serve.